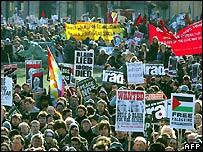 Thousands of anti-war protesters turned out for a demonstration in central London calling for British troops to leave Iraq. Police put the number attending at 15,000, but organisers said between 80,000 and 100,000 were at the rally. It marked three years since the start of the conflict and was organised by CND, Stop The War Coalition, and the Muslim Association of Britain. Protests were also held in other cities across the world. They included Baghdad, Basra, New York, Madrid, Rome, Sydney, Tokyo, Toronto and Dublin. Organisers said it was the first time there have been co-ordinated demonstrations in the US, Britain and Iraq. In London, Labour MPs Jeremy Corbyn and John McDonnell, union leaders Mark Serwotka and Bill Hayes, as well as military families whose relatives have been killed in Iraq addressed the rally. Lindsey German, Convenor of Stop the War Coalition, said: "We believe that a peaceful solution to the chaos caused by the illegal war in Iraq will only be possible when the occupying foreign armies have all been removed so that the Iraqi people will be free to decide on their own political future. "Our demonstration is one of over 200 taking place in cities and towns all over the world, including in Basra and Baghdad in Iraq." Kate Hudson, chairwoman of CND, said there is also "grave concern" about the threat of an attack against Iran. "The US is making charges about a covert nuclear weapons programme in Iran without presenting any credible evidence," she said. "These charges are strikingly similar to the false accusations raised to justify the invasion of Iraq three years ago. "The government must listen to the voices of the people, which is calling on them to bring the troops home from Iraq and to solve the Iranian issue peacefully and diplomatically."